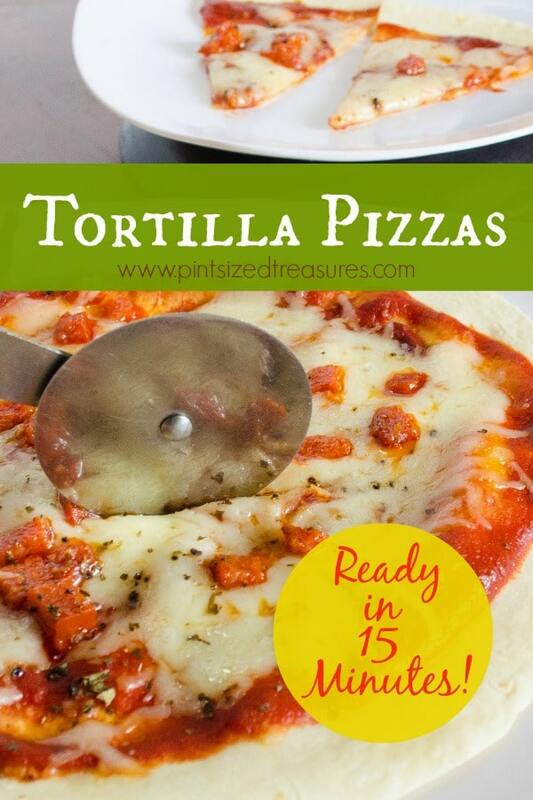 Tortilla pizza is seriously one of my favorite quick dinners or lunches to prepare. I love how I can get this meal thrown together and baked in 15 minutes — really! It’s no secret. My family loves cheese, so of course we LOVE pizza! Plus, as a busy mom I am always trying to find quick recipes that makes everyone happy. Plus, I want to help the thousands of moms who follow this blog! If I can make your life a little bit easier and happier, I want to help! I love how home-made pizza is so versatile. My daughter can have her mushrooms, I can have my olives, my husband can have his extra cheese and pepperoni. Everyone wins with this one. Plus, on beyond crazy, can’t-get-a-minute-to-breathe days, I can ask my 10 and 12-year-old to make this dish and dinner is served! The younger kids get involved too and love sprinkling on the cheese and extra toppings. My kids think it’s the perfect meal if I add some bottles of Coke. We don’t normally keep it at our house, but we do invest in the sugary carbonation when we are having pizza. Coke and pizza just seem to go perfectly together, don’t they? OK you busy moms, no more time for chit-chatting. Gotta share this simple, time-saving and fun recipe that has been a life-saver for this mom! Hope it makes your days a little bit easier and yummier! pepperoni, olives, mushrooms and whatever toppings your family enjoys! Preheat oven to 400 degrees Fahrenheit. Lay tortillas on large cookie sheets. (We normally squeeze two on on cookie sheet.) Top with your favorite pizza sauce, then sprinkle 1/2 cup of mozzarella cheese per tortilla. Add your favorite toppins and some extra cheese if desired. Bake for 8 minutes, or until cheese is melted. Enjoy and share this simple recipe with all your busy mom friends! Yields: 10 tortilla pizzas.